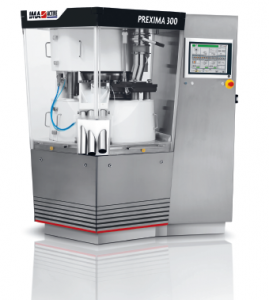 Prexima 300 is IMA Active’s tablet press machine for medium production output. Based on the proven Comprima concept, Prexima ensures complete separation between processing and mechanical areas thanks to the use of purposely designed seals and protections. Along with this feature, the design also provides great accessibility: the processing area is fully accessible once the external doors are opened, while access to the machine basement is required only for maintenance. The Prexima’s compression support is based on three columns linked together by two strong cast iron structures. The compression rollers are incorporated within the two cast iron structures and supported on both sides. This exceptionally sturdy structure – an essential requirement for high quality tablets – guarantees both pre-compression and main compression forces up to 100 kN with maximum reliability. The removal of the turret is quick and easy thanks to a rotating arm completely housed in the upper mechanical compartment. The HMI guides the operator step by step during each phase of turret extraction. Prexima is also provided with the XIMA HMI, which was recently awarded with the A’ Design Award for its usability and its strategic role in improving operators’ efficiency. The tableting is carried out on a placebo formulation, one of the three that should be tested at the APV Expert Workshop Tableting organized by APV at the University of Dortmund on April 2017. The placebo formulation contains high amount of starch, known for its highly elastic behavior under compression. This can also be seen from the force-time profile, where the compression profile appears quite symmetric. The formulation composition is shown below. The main compression force is fixed at 21 kN (420 MPa). The standard deviation is kept as low and as constant as possible. The tablet weight is kept at 250 mg ± 1.5%. Below is the detailed information about the process. Considering that the tablet weight and shape do not change, the result of the compression force application is expressed in terms of hardness (breaking force in Newton) rather than tensile strength (MPa) since the two are directly correlated. 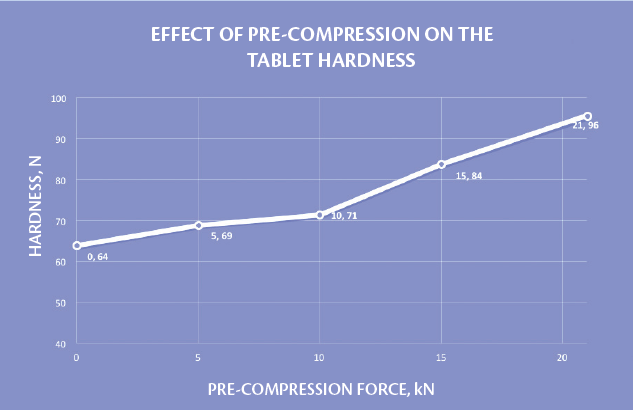 As can be seen from the graph below, the tablet hardness increases by an average of 10 N every 5 kN of pre-compression force, starting from 10 kN (200 MPa). The tablet hardness increases by almost 50%, by going from no pre-compression to the same value of pre- and main compression force. This is particularly important in case higher hardness is requested but it is impossible to further increase the main compression force (e.g. operating close to the maximum tooling loading). It is therefore clear the importance of being able to apply the same pre- and main compression force. Specifically, 20 kN (400 MPa) is only ca 20% of the maximum force applicable on a Prexima 300 tablet press. But if we were to produce bigger tablets, namely round flat tablets of 12 mm diameter, the same pressure of 400 MPa would request the application of roughly 45 kN force in both pre- and main compression. The study above represents a valid confirmation of the benefits due to the compression rollers fitted on Prexima 300. Both pre-compression and main compression rollers have the same diameter (250 mm), thus allowing flexible adjusting of pre-compression and optimal performance with a wide range of products. This exceptionally sturdy structure – which guarantees both pre- compression and main compression forces up to 100 kN – is an essential requisite for good tablet quality.